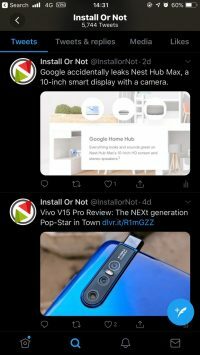 It is high time that the app developers notice the increasing requests from the users to introduce a night mode in their apps. Most of the apps out in the Google Play Store and App Store have adapted to this and are updating their apps with the night mode. This not only helps you in using your phone in the dark but also helps in saving the battery on the phones with an AMOLED display. From what we know, Twitter previously had something called Night Mode which makes the whole app into a blue/grey color. This Night Mode helps in not getting your eyes strained while using your phone in low lit areas. 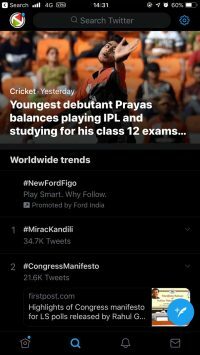 Now, with the new update, Twitter introduced Dark Mode which makes the display go all black and emits no light because the pixels are turned off. This new Dark Mode is helpful in not only saving your eyes but also helps you in saving the battery. To enter into Dark Mode, all you have to do is open Settings and Privacy > Display and Sound > toggle the Dark Mode. 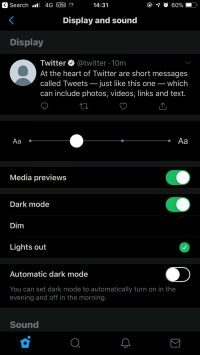 By turning the Dark Mode on, you will initially have the same Night Mode, but with an additional option over there, you can make it pitch black. The bigger perk of this feature is that iOS users get an Automatic Dark Mode which changes the app according to the time zone. For now, the update is out for iOS and is expected to arrive for Android users soon.